Here's a powerful quick reference and clinical tool - small enough to fit into your pocket, yet complete enough to cover any assessment test you need to perform! 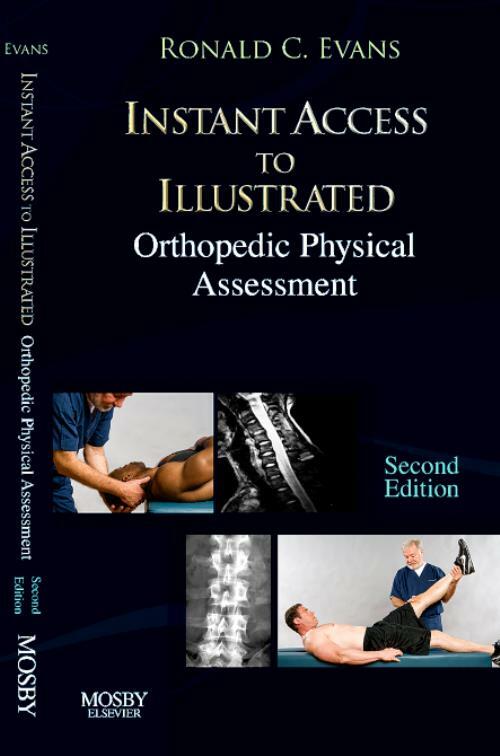 Detailing every test included in Illustrated Orthopedic Physical Assessment, 3rd Edition, this handy, thoroughly illustrated pocket guide includes only the essential information you need to know. Information for each test is presented in a consistent manner for quick reference, and includes: name of the test, alternate names for the test, suspected syndrome, concise description of the testing procedure, clinical pearl, and photo(s) of the procedure. Plus, just as in the parent text, each test also contains a corresponding orthopedic gamut which provides a summary of key points in a concise list, serving as a diagnostic rubric for use in patient exams. Evans, Ronald C. Fellow, Academy of Chiropractic Orthopedists; Fellow, International College of Chiropractic; Senior Staff, ICON Whole Health; Past-Chairman of the Iowa Board of Chiropractic Examiners, Iowa Department of Public Health; Chief Executive Officer, Iowa Chiropractic Physicians Clinic, Des Moines, IA; Trustee, Foundation for Chiropractic Education and Research, Des Moines, IA; Examiner Emeritus, American Board of Chiropractic Orthopedists, Member, Oversight Advisory Committe, Chiropractic Health Care Project, Department of Defense of the United States of America.